One of the most productive things you can do for your business is to have an in-depth holistic online marketing audit done along with an audit of the digital media landscape as its applicable to it and an analysis of your competitors. The audit will discover what needs fixing and addressing within the online environment in which your business operates. The end results of this will be the online marketing and measurement action plan with which to proceed so as to take your online marketing efforts to the next level. What Is The Value Of This Audit? Are we measuring the effectiveness of what we are doing online? Does our business look good online? Where do we need to be online? Is a website enough? Should we be using Facebook, Twitter, etc..? What are our competitors doing online and are they are doing it better? Is our time and money well spent on our online marketing efforts, or is it just an expense? What are we doing wrong and what are we doing right concerning our online marketing? The prime value of the audit will be to make sure you are operating with a solid foundation and to create a online marketing and measurement plan. This plan will provide direction to your online marketing efforts and a feedback mechanism to measure what you are doing online to see how it’s paying off. The goal here is know whether these assets are current, aligned, consistent, claimed, verified and controlled. This is vital as your potential customers can find your business online through many venues. Just imagine if your hours of operations, images of your business and more are inconsistent. Your customers and/or audiences will be confused. Brand Listening For Your Business – In this stage we identify where your business has been mentioned and who is talking about it. This starts will a survey of reviews for your business, where they are occurring, who is making the review and whether you have access to responding to them. Also included is a survey of where your business is being talked about online such as on social media, internet forums and more. It’s possible that no one is talking about it or it’s being mentioned in a positive or negative manner. It vital that you know this and in most cases that you are responding in an appropriate manner. The Digital Media Landscape – The digital media landscape as it is applicable to your business will help tailor your online marketing efforts specifically to your business. Not only is each business is different, but in addition different types of businesses benefit more greatly from different types of online marketing. It is in this stage in which we detail those online marketing efforts with which your business can achieve the greatest return on effort. Competitor Analysis – Identifying who your competitors are as well as best case examples within your industry will provide insights from which we can borrow. When someone searches for the goods and/or services your business provides, you’ll be competing for that online space with your competitors. As such, it is important to know whether your or your competitors business is being found. If you’re competitors are being found more easily, understanding the reason why will be key to improving how your business can be found. Measuring Your Efforts – Online marketing is meant to be measured and without this measurement you are gambling whether your efforts are effective or not. In addition, measuring allows fine tuning of online marketing as new things are tried. Two free measuring tools are Google Webmaster Tools and Google Analytics. They provide the feedback you need to know concerning whether you are spinning your wheels or not with your efforts. In additional to Google’s two tools, there are “platform” specific and third party tools that can be used for measuring your online efforts. Examples include Facebook Insights, Hootsuite Analytics, Social Bro for Twitter and more. Setting these measurement tools up correctly and having them provide meaningful data takes skills and experience. 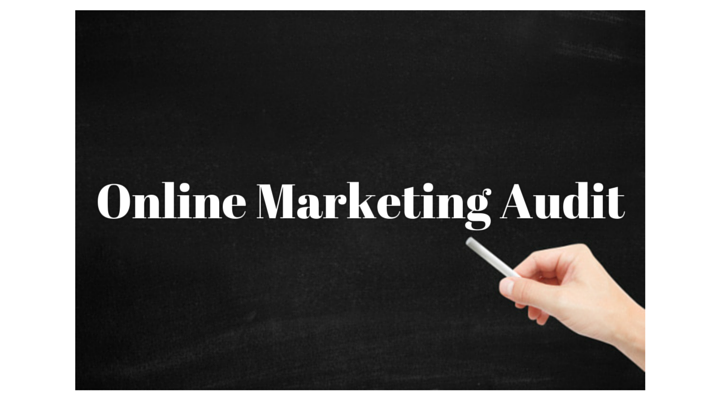 Once the online marketing audit has been completed, we will build the online marketing and measurement plan. The plan will specifically indicate the foundational issues that need addressing and the steps needed to establish proper a proper measurement plan. This plan will be specific to your business and take into account your goals and objectives.